I will never forget the day I started my weight loss journey with System 10. 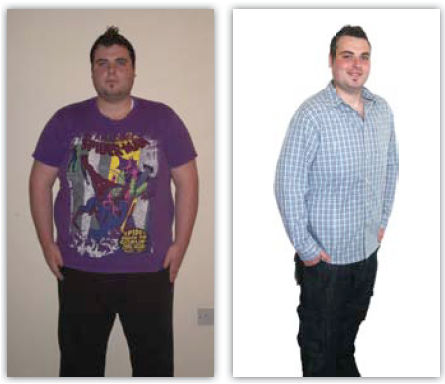 I stood on the scales in their weight loss clinic and I was 26 stone and only 23 years old. I was so depressed I knew things had to change and if anyone was going to help me lose the weight it would be System 10. I had found out about System 10 through a national competition to help people who were morbidly obese, which I was. I applied for the competition and was delighted when I got the news that I had won. At 26 stone I was unable to exercise without being out of breath and was not able to play any sports. I didn’t even have a good diet and spent my time eating take away and pizzas. All this was about to change as System 10 put me on a regime of healthy eating and exercise plans which were designed to get my metabolism working correctly burning off my weight ever day and really reducing the shape of my body. Within a few weeks I was already losing weight and feeling much better. I was never hungry and I always had plenty of regular healthy everyday foods to eat. I was now exercising more and I could feel my fitness level getting better every day. By the end I had lost close to 8 stone* and I ran a half marathon, something I thought I could never do. System 10 has changed my Life I am now a much more confident and happy person and I am looking forward to getting married next year and having a really healthy future. Thank you System 10.